Everyone knows the Super Bowl is an important day for Americans. It’s such a huge part of our culture, even people like me who don’t watch any football at all tune in for the big game. Most years I am too busy stuffing my face with food, beers, more food, a lot more beers, and a little more food that I don’t even have time to pay attention to the football. Since the food is my main Super Bowl focus, I tend to go all out. This year is no different. 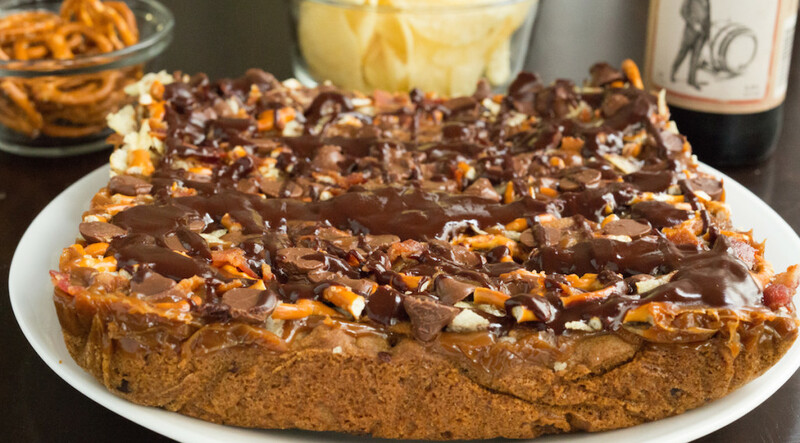 You may have noticed from the title that this dessert is CRAMMED full of some of American’s favorite junk food. 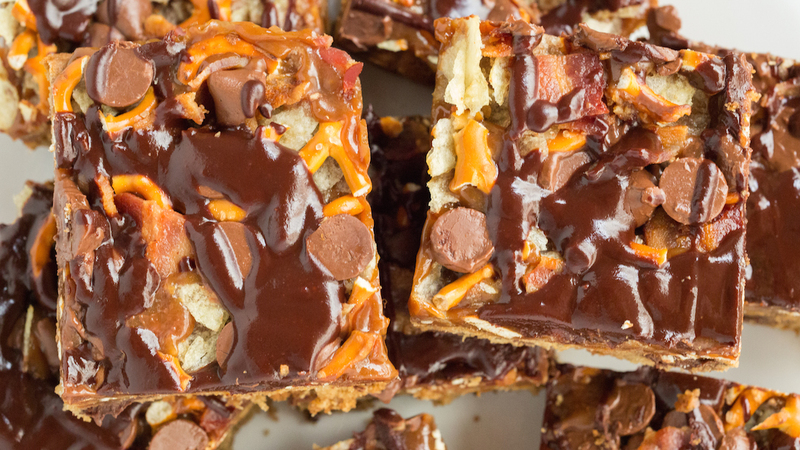 Salty and savory bacon, sweet caramel, creamy milk chocolate chips (filled with peanut butter! ), crunchy salty potato chips & pretzels, all sitting on top of a soft chocolate chunk cookie dough bar. Jesus take the wheel! But what about the beer?? Ah yes, how could I forget that? I’ve seen people rave about Not Your Father’s Root Beer for several months now. When I was at the grocery store last week, a six-pack caught my eye. After trying one, I was truly amazed at how much it tastes like root beer. I definitely see what all the fuss is about. I decided to use it as the beer in this recipe. If you don’t have any, a lager would also work great. I think a dark stout would make a flavorful variation as well. I made the caramel by melting it some of the Not Your Father’s Root Beer. I have a confession to make: I slightly burned my caramel. I broke the cardinal rule of caramel making: don’t take your eyes off of it! ( I was trying to set-up a photo while it was still on the stove.) It was still good, but didn’t have the full caramel flavor you want. Learn from me, do not take your eyes off the caramel! Because you can’t have too much of a good thing, I also put some of the Not Your Father’s Root Beer in the bacon chocolate chip cookie dough. 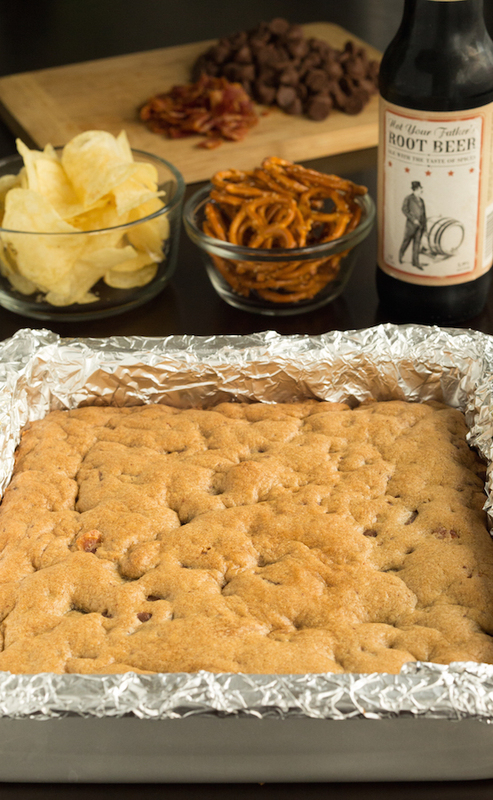 Bacon, beer, chocolate chunks…that’s my kind of cookie dough! I hope your Super Bowl experience is as American as this dessert! Line a 9×9 pan with parchment paper or aluminum foil that sticks up above the edges (this will make it easy to take the bars out at the end and cut into squares). Lightly cover with non-stick spray. In a stand mixer, cream butter and sugar together for 4 minutes. When light and fluffy, mix in the egg and vanilla extract. Turn the mixer to low and add the flour and baking soda. When that is well incorporated, add in the chocolate chips, bacon, and Not Your Father’s Root Beer. Press the bacon beer cookie dough evenly into the bottom of your pan. Bake for about 23 minutes, until edges are lightly browned. Remove from oven & allow to cool in pan. 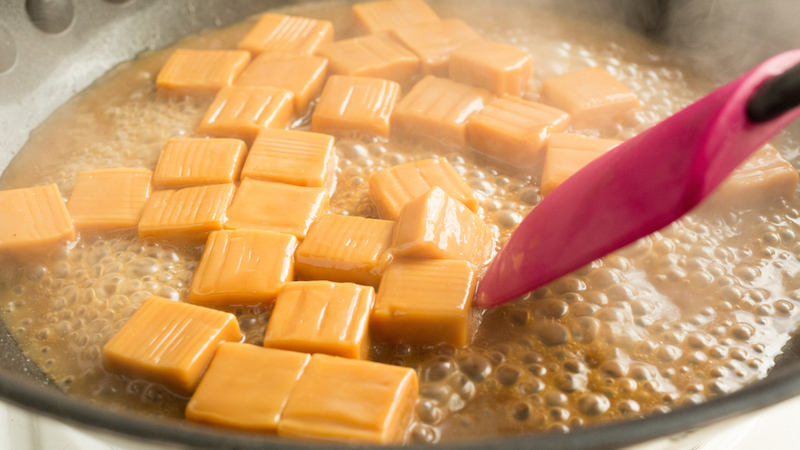 Using a pan over medium heat, melt the caramels and beer. Once melted, let the caramel cook over low heat for 5-7 minutes. (Do not cook too long, it will burn). 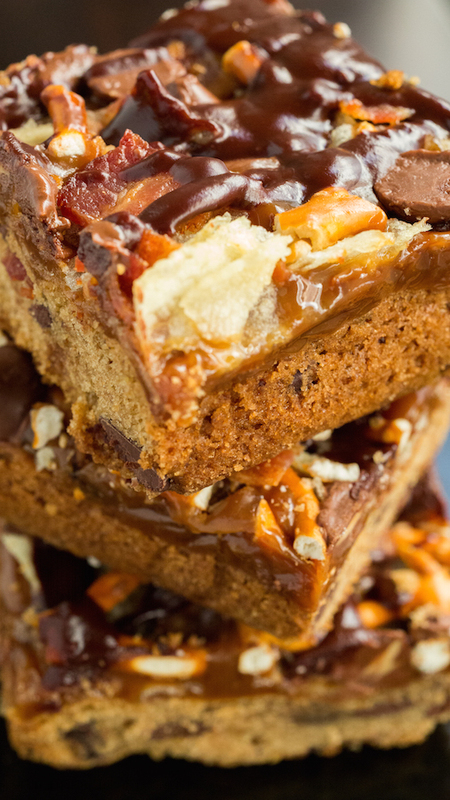 Pour beer caramel over the cookie dough bars. Use a spatula and spread evenly. 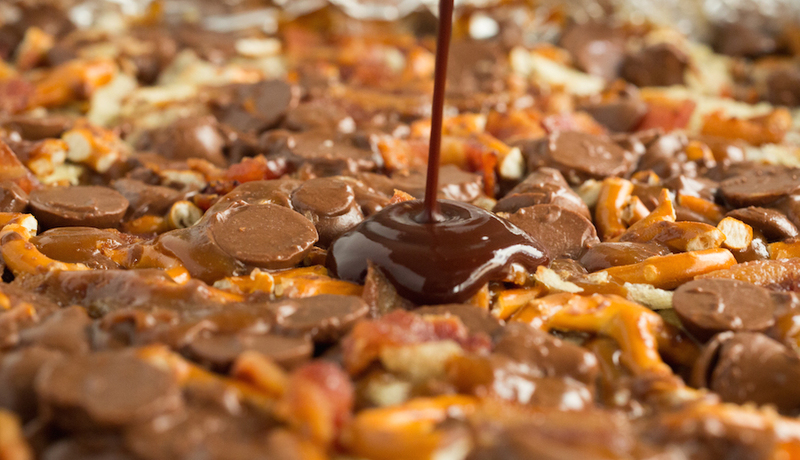 Quickly, while the caramel is still warm and soft, add the toppings (potato chips, pretzels, bacon, and chocolate chips). Microwave the chocolate chips and milk for the topping for about minute. When milk is boiling and chocolate is soft, stir together until smooth. Drizzle over the top of bars. When cool, cut the bars into squares. Enjoy! I think you just broke the internet with these. :0:0 :0. Looks so good!!!!!! I broke my belly too, ha! Thank you, they were very good. I made these bars today for a bacon cook-off in my office! I hope I win! I was so impressed with this recipe! The bars remind me of a candy bar! Thanks for sharing!